Ten days back from vacation, and I am still feeling the positive effects. Which is remarkable. Because I returned to a Chicago that lived up to its status as a cold, windy city. It could not be less like Florida. Yet the city has its own beauty. The bare trees that line my street are outlined in snow, slow dancing stick figures clothed in white. Ethereal. They are no less mysterious and wonderful than the beaches, the pine forests, and the cypress swamps of Tallahassee that I love so deeply. Just different. And colder. Thankfully I have a warm coat. And a home. Where I enjoy cooking hearty, long-cooked food. Like this recipe, which is very similar to my beloved cranberry beans with garlic, sage, and olive oil (http://bit.ly/1bEQWT9), and, like that recipe, is adapted from a recipe in Skye Gyngell’s My Favorite Ingredients. The chief differences between this version and the original are that I substituted chicken thighs for Gyngell’s squab, and, as in the other cranberry bean recipe I stole from her, cooked the beans in a crock pot. If you make this, use the best, most high-quality chicken you can find. It makes a difference.Oh, and I just realized that I accidentally used twice as much kale as I was supposed to. Happy accident that was facilitated by kale being on sale that day. Next time I will probably use less and will likely try it with frozen beans, as I did for the cranberry beans in tomato-fennel sauce over polenta. (http://bit.ly/1cIRZ9s) This time the beans were mushy and not very pretty. But the flavor was terrific. So good that as she took her first bite, one of the two friends I was cooking for, a serious foodie, pretty much melted into flavor ecstasy. Which I totally agreed with. Even if it wasn’t humble. This recipe is also nice in that it’s gluten-free, affordable, nourishing, and, while not the most simple dish ever, quick enough to make for a week-night dinner. Here’s the recipe, which will serve six. Or, if folks are really big eaters, three. 1. To cook the beans, pick over to remove any that are discolored or broken, rinse, and place in the insert of a slow cooker. 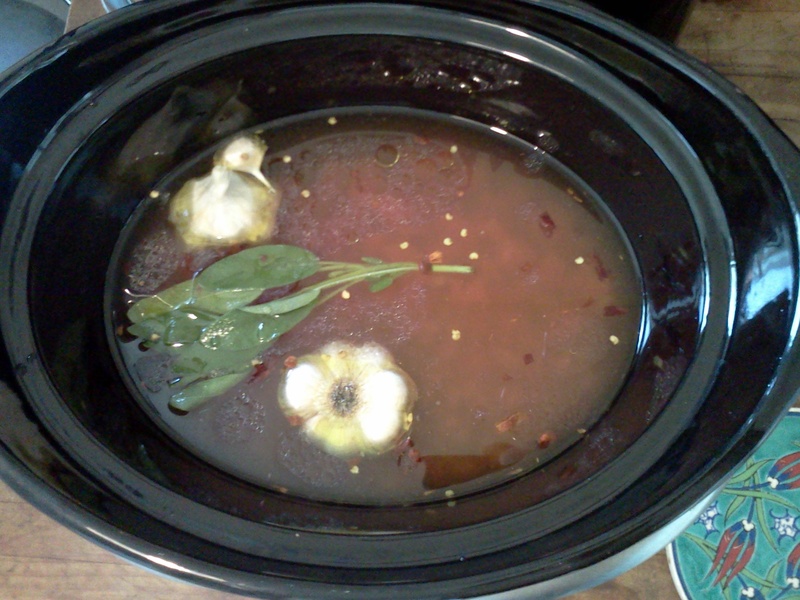 Add the tomatoes, sage, garlic, olive oil, and kombu. Crumble the chili pepper over the top then pour cold filtered water to cover by 2 or 3 inches. Cover and cook on low for 8 – 10 hours. 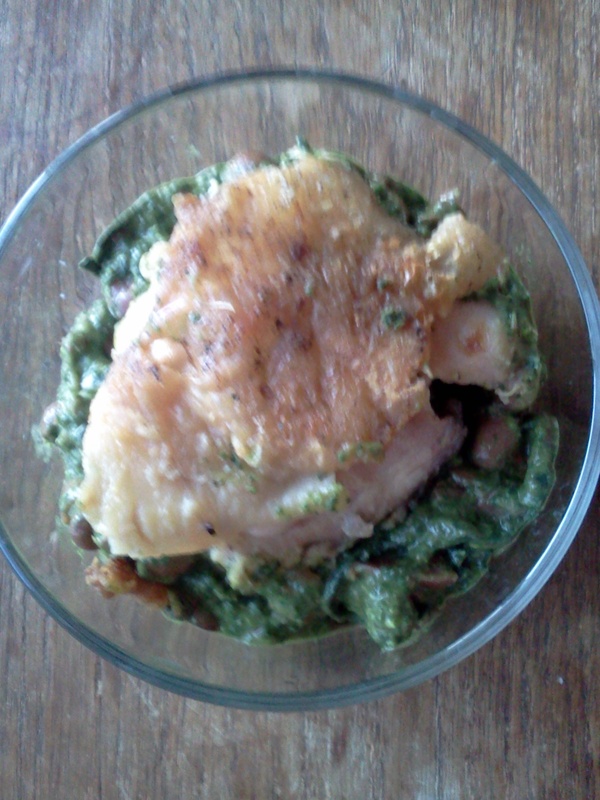 When tender, salt generously and allow to cool in the cooking liquid while you prepare the chicken and kale. 3. For the kale, bring a large pan of well-salted water to a boil. (When I think ahead, as I did this time, I fill the pot with tap water in the morning and let it sit all day. My theory is that this will allow the chlorine to slowly rise out of the water instead of all at once. I do this because of some talk I heard a million years ago while visiting a friend in Bolinas, CA. I don’t know if it’s true. But it made sense at the time. So I do this as one of my small ways to ameliorate guilt about being a human and living a modern life here on earth.) Wash the kale leaves and strip them off the stalk. I do this by holding the end of the stalk with one hand, while grabbing on with the other and sliding it down the stalk. When the water is boiling, transfer the kale to the water and cook for 2-3 minutes. Drain and dress the leaves with the olive oil while they’re still warm. 3. 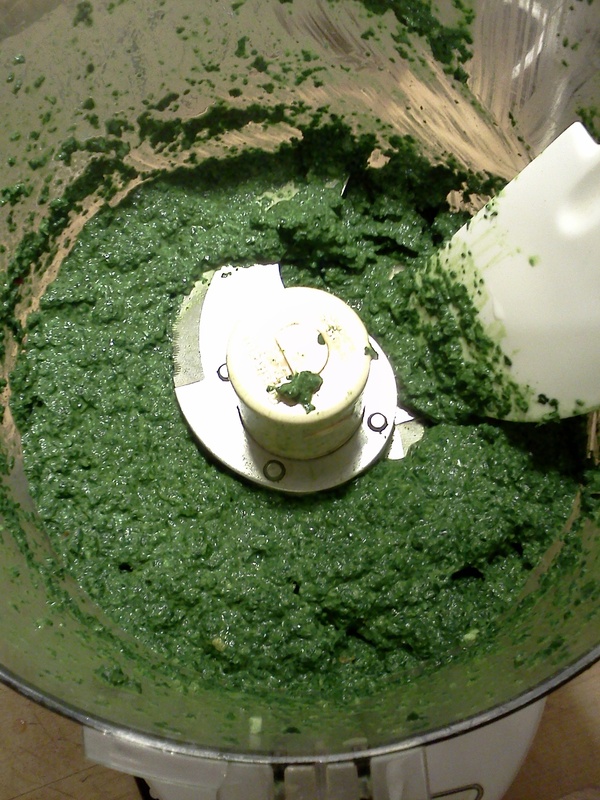 To make the pesto, transfer half the kale to the bowl of a food processor. Or, if you decided to go for 2 pounds of kale, transfer all of the kale to the food processor. Add the butter, garlic, anchovy fillets, and chili. Process until smooth, using a spatula as necessary to push down the sides. Season to taste with salt and a little pepper. 4. Drain the beans, reserving the cooking liquid if you like (I like to freeze and use it as a substitute for broth) and discarding the garlic, sage, and kombu. Place the beans in the cooking pot and stir in the pesto. Add the whole kale as well if you decided to go for the full amount. Cover and set aside. This entry was posted in Beans, Cooking, Gluten free, Slow Cooker, Winter and tagged Beans, chicken thighs, Gluten-free, hearty, kale, olive oil, winter. You are amazing! I love your blog; although, you would have to make every receipe for me. You are truly amazing. And know, that I admire you in every way, not the least is your legal abilities. You are so creative in your cooking, and maybe more so in your legal analysis – you go girl, you go!